If you like acting and having all eyes on you, Guesstures is the game for you. 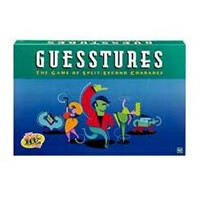 Guesstures is a party game where teams take turns trying to guess the correct words that are acted out by one of their team members. It is a game of split-second charades. Just because no talking is allowed, Guesstures is by all means not a quite game as guess get yelled out as fast as they can. Guesstures will sure highlight your acting skills and is a fun game for large groups of people, as long as you don't get nervous. Be sure to check out the rules and instructions so you know how to play. Play Guesstures with your friends today! Be the team to score the most points by guessing acted-out words and you're the winner of Guesstures. Guesstures has 504 cards, card box, Mimer-Timer, 2 label sheets, a crayon, and the Guesstures game rules and instructions. Please keep in mind that the official Guesstures party rules and instructions could be different depending on the game version you have. The rules below are some of the exact directions on how to play Guesstures. Share with us your comments, funny stories, tips, advice, strategies, creative ways to play, questions about how to play, problems with the rules or anything you want about Guesstures. All submissions will be reviewed within 24 hours. Click here to add your Guesstures comments. Acted out games are some of my favorites. Once everyone gets outside their shell and in a fun free zone, it is always a lot of fun. Be sure to set clear rules on what is allowed and what is not (holding fingers up for numbers, etc.). Also love how easy it is to teach others how to play.